In 1452, Florentine sculptor Lorenzo Ghiberti unveiled a masterpiece that had been a quarter-century in the making: ten bronze panels depicting intricate scenes from the Old Testament. The monumental gilded bronze doors (each more than 15 feet tall) were designed for the Baptistery in the Piazza del Duomo in Florence. Centuries of admirers have considered "The Gates of Paradise" one of the great masterworks of Western art. This extensively illustrated book displays the full glory and elaborate details of many of the newly restored bronze panels, the extraordinary work of the conservators and restorers who cleaned the priceless doors. 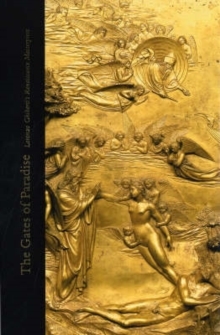 In a series of fascinating chapters, expert contributors capture Ghiberti's world, his remarkable talent at representing human emotion in rich illusionistic settings, the relationships between Renaissance patrons and artists, and the collaborations and rivalries among artists. Other chapters explore the challenging craft of bronze sculpture, Ghiberti's casting and finishing techniques, and the painstaking process involved in documenting and restoring the treasured doors. A chronology of Ghiberti's life completes this lavishly produced volume. Pages: 184 pages, 269 color illus.